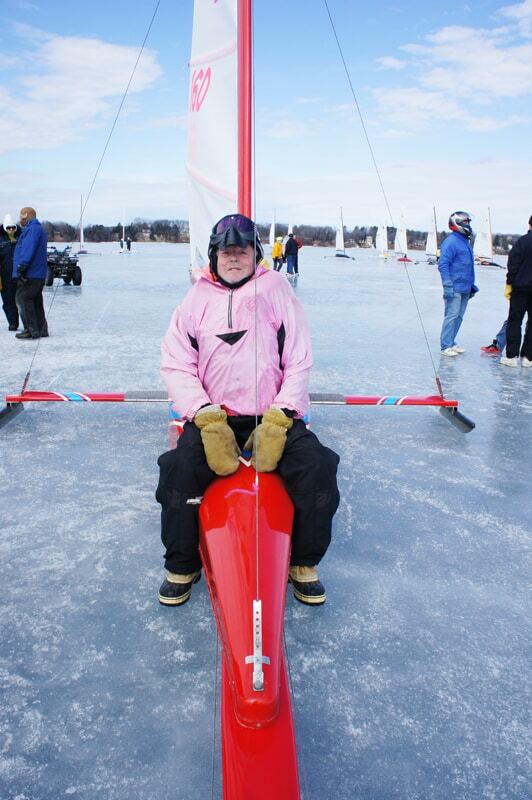 Menekaunee Ice Sailor Ken Kreider at the 2018 Nite Nationals on Green Lake. The Menekaunee Ice Yacht Club invites ice sailors to join them for a fun weekend of sailing on Green Bay in Menominee, Michigan March 24-26. Ken Kreider and Mike Derusha have been sailing all day. They report 20″ of ice,no cracks, no shell ice, and some patchy snow that they had no problem sailing through today. The sailable area north-south is 2.5 miles; east-west is 1 mile. In order to preserve the landing, they ask that once you drop your trailer on the ice, please park in the lot. Launch: Great Lakes Memorial Marina Park just south of the Menominee Marina.You can park your car in the lot there.